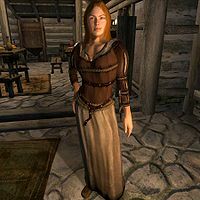 Signy Home-Wrecker is a Nord thief and a member of the Sirens gang in Anvil. If you are playing a male character, she will attempt to seduce you into coming back to their place, Gweden Farm. If you are playing a female character, she will direct you to talk to Faustina Cartia, the leader of the gang, about joining them. Later in the quest, you have no choice but to kill Signy, for she attacks you in her cottage with two other gang members. She wears a set of middle class clothing: a brown shirt, light brown linens with a pair of pigskin shoes. She is armed with a steel dagger and carries a small amount of gold. If you are a male character, Signy will be the one to seduce you: "I haven’t seen you here before. Awww, and you’re all alone too. How sad. Well, if you’re up to it we can solve that little problem. You see, me and Faustina here are lonely too, and we’ve been looking for someone. You look like just what we need. I’ll tell you what. We have a cozy farmhouse not far from here where we could... well... get to know each other much, much better. I’ll mark it down on your map, just so you won’t forget where to find us. Meet us there around 11 in the evening. I can promise you a night of fun you won’t soon forget." When you ask her to elaborate she will only say: "Do I really have to spell it out for you? You’re a man, and I’m a woman with a certain desire. You figure out the rest." If you are a female character, Signy will simply point you towards gang leader Faustina: "Talk to Faustina. She’s got a proposition for you." After Faustina has offered you a membership in the gang, Signy will say: "Be nice to get another pretty face in the gang. Hope to see you there. You can make a good deal of money in our gang. But you have to be willing to show a little skin if you know what I mean." Esta página foi modificada pela última vez à(s) 03h05min de 27 de abril de 2013.